Creating backlinks links for blog is the major aim of any blogger. Backlinks are indication of the popularity of blog and important for SEO because some search engines, especially Google, will give more credit to blogs that have a good number of quality backlinks, and consider those websites more relevant than others in SERP's for a search query. But just build only quality backlinks otherwise it will harm your website. Generally link are of two types Dofollow and Nofollow links, dofollow allows search engine crawlers to crawl your blog whereas nofollow links do not allow search engines to crawl websites but give some referral traffic. In this post you will read about a very new and unique strategy of creating backlinks using broken links. A broken link happens when the link points to a web page that has been deleted or moved.A broken link is a link that doesn't work and often resulting in an error page. How to create backlinks using broken links? Make a list of good website and blogs from which you are planning to get backlinks. 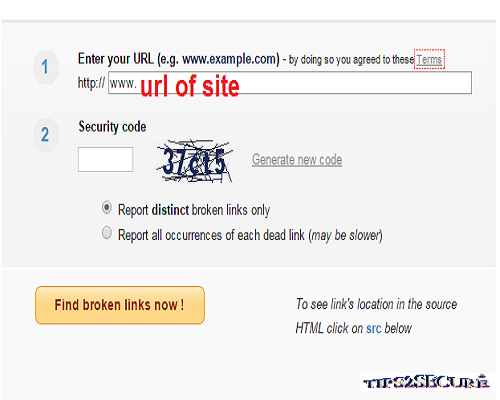 For example, If you want to get backlink from tips2secure then place www.tips2secure.com in Url box then fill security code and click on 'Find broken links now!'. It will show you the lists of broken links from this website. But you won't find any broken link in my blog, so you should try different blogs to find broken links. Tip: Also analyse your own blog and fix broken links from your site ASAP. Next step is to contact owner of that blog. You can find contact details of owners mostly in their 'Contact Us' page. In next step you have to make inform the blog owner about broken links in their site. In this step you have to send an email to owner and confirm him/her about their broken links. In email you have to make request to replace broken link url with your's one. But make sure the link you are sending from your blog to replace must be related with the article which had linked before on that broken link. If you do not have any post related with that topic then you can try for some other link or write the same article and post on your blog before making the request to admin. Now you have to repeat the above given steps again and again to build more links. Its quite simple and easy to get backlinks without doing much efforts. How creating backlinks using Broken links is better than Guest Posting? Getting backlinks by writing guest post is a lengthy and time consuming process. If your written material is rejected by the admin then It will be panic for you. Also to write a post it takes around 30 minutes to 1 hour, but finding broken links and making a request to owner takes your 5-10 minutes hardly. Chances for acceptance of broken link replacement is more than guest post approvals. In guest post writing you have to write very carefully and if there is any grammatical mistake then also it will be rejected by the party. But broken link replacement strategy can be easily done by any blogger without doing much efforts. How creating backlinks using Broken links is better than Commenting? Commenting on forums and other niche related blogs are mostly give nofollow links which may not more beneficial for bloggers. 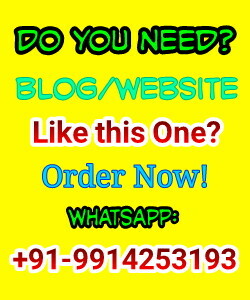 But links which we get from broken link replacement mostly give us dofollow links which help our blog to rank higher in Search engine result pages. Message: I hope that you have enjoyed 'New Strategy To Create Quality Backlinks Using Broken Links in 2015' article. However, if you want me to deliver more articles then please share my post. You can use Social Sharing Widget provided at the end of every post. After all, Sharing is Caring!. Hi Suresh, thanks for sharing this wonderful tip for getting dofollows with broken links of other blogs. Can you tell me if my blog is having broken links. It will show you the list of broken links if your site have any. I am proud for nice high PR quality full back links.you have shared free quality full blog thanks for sharing.It's more useful and valuable for me.If you want same SEO tips you can visit my site how much does seo cost. Great post. This is very informative and effective article. I think its very helpful for us. Thanks for your nice post. Can you please tell me some travel related website i can refer to find broken links. I am really not aware from this niche website. I run my travel blog so if you suggest any then it will be helpful for me. Thanks for this article but this not working now. these idea is not popular now a days.